Last week I hosted a dinner party for our friends. A long due dinner, I had been planning but could’nt pull it off due to travelling, work and kids. All of the main courses, starters, salads and sweet dishes were made on that day only since I was busy with cakes, the day before. Work attracts more work, thats all I can say. Anyways, I am mostly comfortable in making continental sweet dishes as Pakistani sweet dishes tend to be more complicated and time consuming and require expertise. However, this one is exceptional. It can be prepared in half an hour from start to finish. 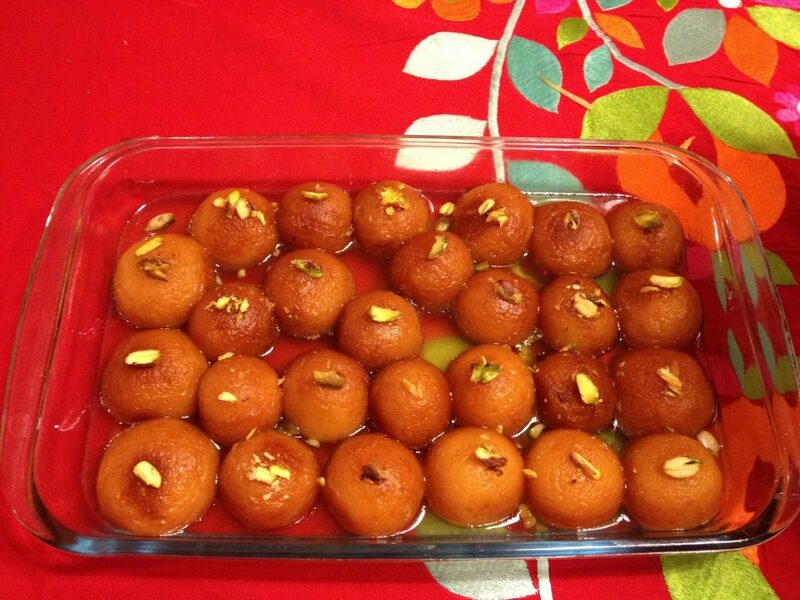 Gulab Jamun is the name in Urdu – the national language of Pakistan. Gulab means Rose and Jamun is a fruit, not sure its exact English word. They are fried little dumplings soaked in sugar syrup and taste amazing. Sprinkle with some crushed pistachios and I can bet, you have a winner. A very simple recipe but some tips help in achieving perfection. 1. Make syrup first. Put all ingredients in a large sauce pan and leave it on medium flame, stirring occasionally till the sugar dissolves. 2. Start preparing dough for the dumplings. Mix first four ingredients by hand. 3. Start adding egg till binding is achieved and soft smooth yet manageable dough is formed. Egg may be utilized completely or little may be left. 4. Make balls of about 1.5 inches. If they are dry or appear cracked, smooth them with hands and little egg. 5. Heat oil in a frying pan for somewhat deep frying. 6. The oil should be medium hot else the dumplings will burn as soon as they touch the oil. 7. Once all the balls are made (around 12), fry them stirring continuously until dark brown. 8. Add them to the cooking syrup and cover and cook on medium flame for 15 minutes. 9. Cool and dish out, sprinkle with pistachios. « Scones and that too chocolate! !